AFTER THE FIRE shot to worldwide fame with Hit Singles in Europe “Laser Love” and “One Rule For You” in 1979 and “Der Kommissar” in 1983. In the USA “Der Kommisar” made the Billboard Top 5. 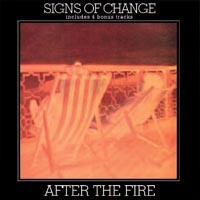 “Signs Of Change” was originally released in 1978 (with vinyl copies now changing hands at over £100 each which is itself a testament to its “progressive” quality) on the bands own Rapid label and sold over 4,000 copies in weeks before it was deleted when they signed to CBS and life was never the same again for the band . 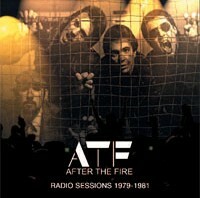 The album has been remastered with four bonus tracks added. 'Signs Of Change', their debut album, is a prime example of progressive rock, Peter Banks' keyboards propelling the music into the retro future...There's much, indeed: three additional tracks from the album's period...plus a demo, to make 'Signs' last deservedly longer. 'Signs Of Change' was the band's 1978 debut set...now remastered and reissued with the addition of four bonus tracks in the then spectacularly unfashionable keyboard driven prog rock style which dominated their early output. All in all a pleasant listen, with 'Back To The Light', 'Signs Of Change' and 'Pilgrim' (an epic 11 minutes) are the stand-out tracks for me. The four bonus tracks sound a bit rough around the edges but are still worth a listen. ...this album in particular has now become a highly sought after collector's item in its original vinyl form...now remastered and re-issued with the addition of four bonus tracks in the then spectacularly unfashionable keyboard driven prog rock style which dominated their early output.